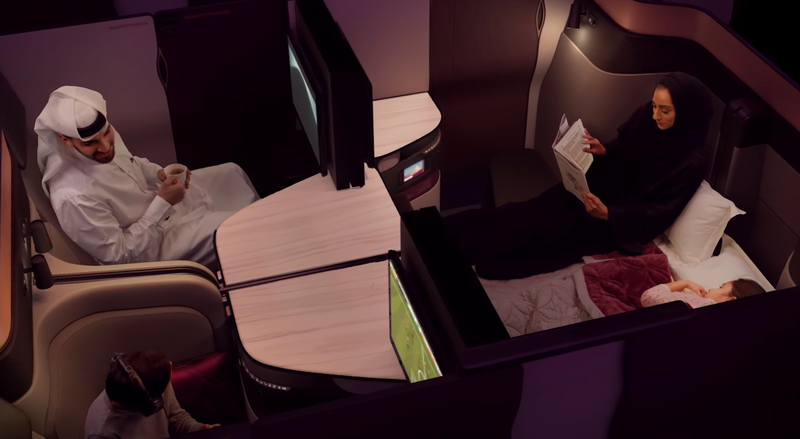 Introducing the long anticipated Qsuite product by Qatar Airways. The Doha based airline is launching a business class hard product that is branded as “first in business”. Many people who’ve sampled the demo Qsuite have been blown away as it rivals others’ first class seats. The center seating section is set in a “quad” configuration. This allows families or parties traveling with four people to lower the center divider and easily converse. In addition to a private four-person suite, each passenger can lower their seat into a fully lie-flat bed. For long-haul flights I can see this being a huge benefit for families or couples traveling together. You can check out this CNBC video demoing the quad seating layout. The Qsuite configuration will initially launch on the London to Doha route in early June. Flight numbers to/from DOH/LHR are 7 and 8. According to this Flyer Talk thread, the first flight will be on June 10th operated on the Boeing 777-300. With the first route being London to Doha, this makes it easier for OneWorld passengers to connect. 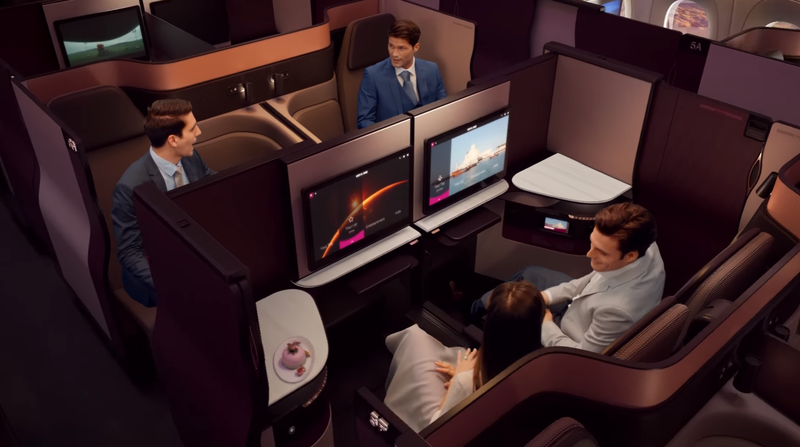 Later this year we expect to see this Qsuite product roll-out on additional flights from Doha to; Paris, Tokyo, Sao Paulo, and New York. 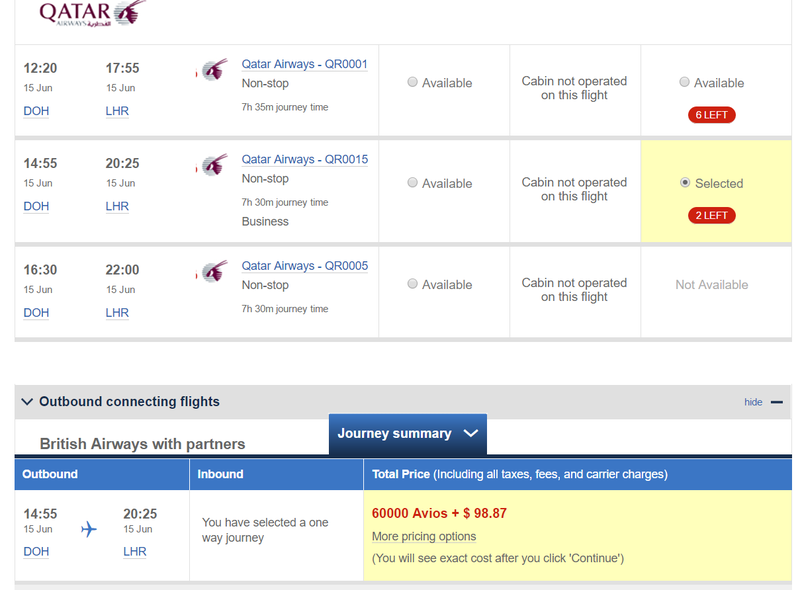 Of course, you can purchase your ticket from London to Doha (and vice versa) on flights 7 & 8. Do you have $3,700 lying around for a 7 hour one-way flight? As a $3,700 one-way ticket is not practical for most, here are award redemptions for flying in the Qsuite using AA miles or British Airways Avios. Once you’ve found award space on British Airways, you are set to call American Airlines (800-433-7300) to confirm your Qatar Airways booking. It is going to be VERY difficult to find award space on the Qatar 7/8 flights from London to Doha initially. You can subscribe to Expert Flyer and create a seat alert to be notified when (if) award space becomes available. Also, American Airlines allows you to change your routing and dates so long as your start and end airports don’t change, at no cost when redeeming points. If you booked your flight from London to Doha on Qatar and award space later becomes available on flight 8, you can call American to change your flight at no cost. Citi AA card holders, Platinum or higher, will receive 10% of their redeemed points back as a rebate (up to 10k points per year). That means redeeming 42,500 AA miles will only “cost” you a net 38,250 miles!